I don't post many pictures of my self on this blog, and that's mainly because I'm the one behind the camera. 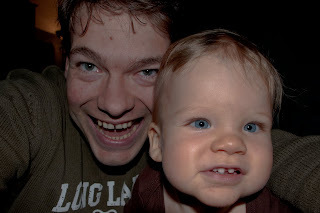 But here is a shot of Sebastian and me, playing around on the floor. I'm holding the camera in front of us, desperately trying to take a picture as Sebastian is trying to grab the camera. It's been a rainy week-end, and I don't have much to write about. Sebastian is a happy kid, and his not giving us any big worries yet. If I haven't told you yet; He now has 8 teeth, and can stand by him self for a short time. He is eagerly practicing to walk when holding our hand (I said hand, as two hands are for amateurs :P ). I've uploaded this and a few more shots to Sebastian's album.